The key reasons why high-tech ceramic is becoming increasingly popular across architecture and construction include the incredible versatility and high performances of materials. 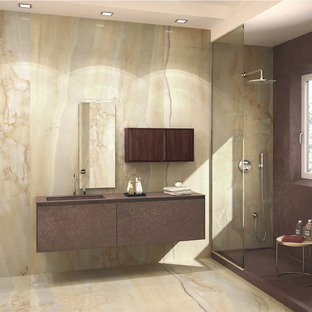 Porcelain is well-known for its particular properties: strength, stability, non-absorbency, and simplicity when it comes to laying and maintaining the tiles. 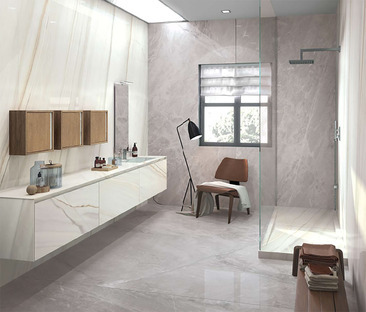 These features mean that high-tech porcelain can be used in a host of different contexts (schools, offices, showrooms and all public and residential areas). It is favoured over the original materials, which are more prone to alterations, organic defects and variations in appearance over the long term. 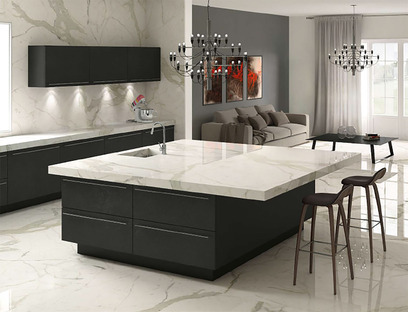 FMG Fabbrica Marmi e Graniti takes a creative approach to using the potential of high-tech ceramic in its range of Maxfine maxi slabs , which measure up to 320x160 cm. 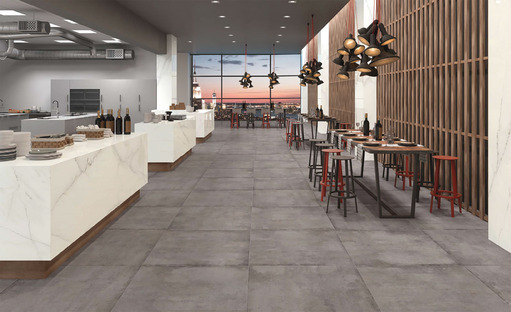 Maxfine high-polish porcelain maxi slabs help blur the traditional distinctions between architecture and furnishings, producing robust yet lightweight surfaces which are just 6 mm thick. They can be used in inventive applications not only as floor or wall coverings, but also as furnishings and finishes for interiors and exteriors alike. Ideal in any setting, Maxfine maxi slabs become materials and shapes which designers can model at will for use as coverings in every location imaginable: they also work beautifully as indoor tables and doors, reception desks, kitchen and bathroom tops (not to mention coverings for sinks or showers), the outside of drawers and doors and even closets. In outdoor contexts they are perfect in ventilated facades, benches and flower planters; they can be made to measure or mass-produced. 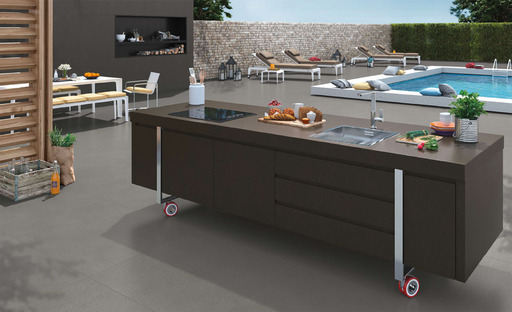 All these solutions co-ordinate to perfection with all the other Maxfine collections, including those shown in the gallery: Limestone, Citystone, Onici, Iron and Marmi. 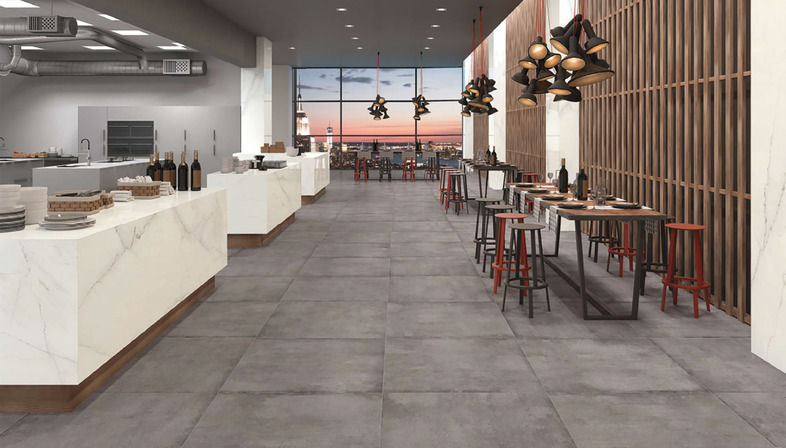 These floor and wall coverings bring together the classic and the contemporary, as seen in the stone-effect tiles Citystone and Limestone; urban design inspired by post-industrial landscapes, as in the distressed steel and metal sheet effects of Iron; the timeless luxury and prestige of marble effects (Marmi) and of the luminous ornamental stone (Onici).